The Metatronic Mat applies the science of Etheric Healing, aligning the individual to a peaceful, meditative state that allows the meridians and chakras to be balanced as the individual becomes attuned to the higher vibration of light found within all life. The Metatronic mats are used for Healing, Self-Healing, Restful Sleep & Deep Meditation. The Metatronic mat is designed to attune to ones meridian system and the natural magnetic field of the body; neither over-stimulating nor under-stimulating but balancing and purifying the energy systems of the body. It works on the causal body all the way down to the energetic field as it applies the divine configuration of the Vesica Pisces to attune to the DNA in the body; both the physical DNA, the light that is in the DNA and the magnetic field that carries that light. By holding two sacred geometric vajras that are connected by wires to the mat on the left and right side, all 7 chakras - the higher chakras and the lower chakras are balanced and connected in right relationship. This gives your brain the opportunity to fully open up. By comparison, when we spend time thinking selfishly about ourselves and our problems or are stressed and worried, we are only using ~10% of our brain. The Metatron Mat Systems have a 24kt gold plated copper disc 2 inches in diameter which can be connected to the copper plates at either the top or the bottom of the mat. Flower essences, homeopathics, gem essences, geometric forms, holy water, pictures of saints or holy places can be placed on the plate prior to meditation - the vibration of the object infuses into the whole meridian system through the radiation of the Metatronic Grid. The Metatron Mat systems can be used for both direct and distance healing. Pictures, objects, names of people can be placed on top of the Metatron Mat to heal whatever is in or around them.The effect is not limited in space or time, and any person, animal or place can be treated in this way.The form helps the energy inside a person to become whole. By using an Etheric weaver as an individual lays on the Metatron Mat, the effect is increased. It picks up the prana or Qi of the Earth.The individual's Soulful nature is stimulated further, without any thinking, wishing or believing, as they are automatically attuned to the Earth's Qi and connected to Cosmic Qi - releasing one's natural state within the Plan of God. This process happens without any danger of drawing negative energy out. It works in a similar way to the tuning function of a radio, literally finding a certain frequency where something special is transmitted.The form tunes constantly into the harmonic field of Peace and Wholeness. Practitioners find that using the Metatron's Mat system in combination with their own therapeutic practices speeds and deepens the healing benefit for the client rather than using their healing modalities alone; the practitioner is also more protected from absorbing negative energy as their clients are automatically transforming, transmuting and healing themselves while simply laying on the Mat and holding the Vajras. The Soulful healing energy received from the Metatron Mat system helps to clear rents and blockages in the etheric field, which manifest in our lives as physical problems, emotional patterns that can be hard to change, and unhelpful thought forms. As our Chi energy increases, these densities of energy begin to shift and transmute, manifesting as greater emotional balance, physical well being, clarity of mind, and happiness. This may go along with positive life-changes, as we have greater courage and discernment to release from negative circumstances or relationships that may be in our lives. Healing with the Metatron Mat works on the cause of dis-ease in relationship to the energetic field. The Metatron Mat applies magnetic healing, but this is just one aspect of the healing science involved. It creates a powerful therapy - for transcendental meditation and self-healing. Physical healing can never be guaranteed, but laying on the Metatron Mat has often been found to bring relief to a wide variety of ailments both chronic and acute. Note: this does not negate the need for professional medical care as appropriate. The Metatron Mat systems can be used over a seat while working, driving or flying. It is used by many practitioners, both medical, psychiatric and holistic, with their clients.. This means most people get to use the Metatron mats continually, both day and night; maximizing their usefulness and effectiveness. Why is the Metatron Mat System so unique? The Metatron Mat is not just a magnetic or electro-magnetic healing mat but has a design made in the Vesica Pisces which is the general form of life itself. A divine pattern. The Metatron Mat incorporates the sacred geometric principle of the Vesica Pisces. All of the different types of life we see on Earth are uniquely and universally geometrically patterned. The Vesica Pisces is a diamond shape that contains the Phi Ratio which is found in our DNA, in rocks and minerals, in water etc. - in the atomic structure of life. All of these things are patterned by a divine imprint that is placed into life, that esoterically is known as God. The Metatron's Mat helps to attune our natural connection to God and our Buddha nature/ Soul, which builds greater purpose and joy in life. The divine pattern of the Vesica Pisces is built into the Metatronic Mat through a series of diamonds that make one or two large diamond grids (depending on if the mat is half or full body length). 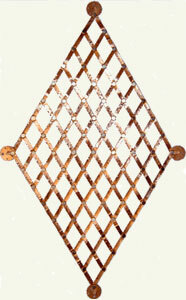 The grid which connects these diamonds together is made of copper tape for increased energetic conductivity. At each intersection of each diamond is a powerful gold plated Neodymium Rare Earth magnet which connects to the vibration of the Earth. This means that over one hundred magnets are used per grid. These magnets give the best fields possible in permanent magnets allowing for very high energy products to be achieved in a perfectly balanced proportion. The Sacred Geometric Grid is made from copper strips laid in exact relationship to the Vesica Pisces (see below), so that each grid contains a matrix of 64 proportionate smaller diamonds. A Powerful Neodymium magnet is placed at each of the 81 connecting points in the grid, activating the grid as an electromagnetic field with magnetic pulses in a specific pattern aligned to the Vesica Pisces. The copper allows natural currents of electrons to flow in the form of Etheric Magnetic Prana (vitality), directing the Pranic Fluid to increase as meridian points are stimulated by the magnets. The Vesica Pisces is found in flowers and all sacred, natural geometric reality. It is built into the design of the Metatron Mat which is laid out in a series of diamonds that make one large diamond, all connected by a copper grid. At each of the points where those diamonds connect together there is a neodymium (rare earth) magnet that connects to the vibration of the earth. The neodymium magnet resonates with the meridian energy in one's body aa well as the natural magnetic field of one's body. It doesn't over-activate or under-activate, but actually attunes to the body itself. Due to the geometric configuration, there is an attunement to the DNA and the magnetic field that carries light. The Mat is balancing for all the meridian energy and chakra energy due to the sacred design and the type of magnets used. Double terminated quartz crystals are placed on copper tabs at the tips of the larger diamond which amplifies the energy of the grid with the pure resonant healing frequency of quartz crystal. The four copper tabs are connection points for pure copper wires that attach to two vajras which the person meditating or receiving the healing treatment can hold in each hand. This stimulates the natural healing energy found in the hands to radiate through the person's whole meridian system, just like receiving hands on healing over the entire body. There are two sized mates: The Full Metatron's Mat has two geometric grids, it is 5 feet long and 18 inches wide, while the Half size Mat has one grid 30 inches long and 18 inches wide. 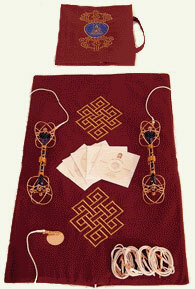 Mat with two sky vajras, wires, carrying case, and CDs of sacred music. The CDs are played during Soul Therapy while the client lays on a mat, holding the two vajras.